We were waiting in the library for the press conference to begin. It was an unseasonably warm day in Brooklyn, and some of the windows were open and others had signs on them: DANGER! PLEASE DO NOT OPEN WINDOW! BROKEN! We were waiting in the library of a public high school on Flatbush Avenue, and there were sandwiches and coleslaw and pickles and bottles of Coca-Cola on the table, and shelves full of reference books that looked as if they’d hadn’t been opened since Neil Diamond attended this same high school, Erasmus Hall, long before it had been hacked up into a series of smaller specialty institutions (all of which form a single football team). We were awaiting an announcement that had already been made: Wayne Morgan, the best prep football player in New York City, was going to Syracuse next season. He’d told it to the morning papers; he’d revealed to them that he’d chosen Syracuse over Connecticut, and there was no suspense, but this was National Signing Day and all of Morgan’s teammates were here and so was a live webcam from the MSG Network’s Varsity website, and we were waiting on the show. And then Landberg realized he’d forgotten The Hat, and so he dispatched one of his players to go get it. The Hat was retrieved, and — “Oh, mother” — Landberg realized he’d forgotten the letter of intent, so he went to go get that. Finally, Morgan’s mom and brothers showed up, and Landberg came back with the letter and The Hat, and we all took our places, 34 minutes behind schedule. Morgan’s teammates crowded the space just off-camera and Morgan and his mother and his coach took a seat at a wooden table, and the cameras rolled, and the man from MSG Varsity asked several scripted questions. Finally, he asked Wayne Morgan to reveal his college choice. Morgan read some prepared remarks, thanking the people he was supposed to thank, and he signed the letter of intent and put on The Hat, blue with an orange “S.” The man from MSG Varsity prompted us to applaud, and then prompted Morgan’s teammates to approach the table and shake his hand, which they did. I’m not sure exactly how or when the rituals of National Signing Day became so rigid. I’m not sure when it became second nature to assume that Wayne Morgan would have to put on The Hat, or that he would obviously sign a letter committing to an institution of higher learning before a national audience in a school library, but the choreography is now second nature to those who grew up in the era of ESPNU. Perhaps, since this was the highest-profile recruit Landberg had coached at Erasmus, in an area where basketball typically takes precedence over football, the little gaffes in the staging were understandable. The no. 1 prospect in the country, Dorial Green-Beckham, signed with Missouri live on ESPNU in front of the entire student body, the pep band, and the cheerleaders. What happened at Erasmus was modest by comparison. Of course, the tendency is to condemn all moments like these as totems of national excess, and to question why teenagers feel the need to choreograph their decision-making, and to ask ourselves why all of this is being televised and webcast for national consumption. We want this, and yet we don’t. 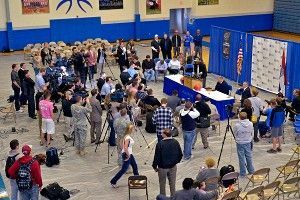 We agree that high-school recruiting is one the weirder and more fucked-up rituals in American sports, and yet we also agree that by bloating National Signing Day into the culmination of this ritual, we are merely giving people what they want. At one point during his Q&A session, Morgan revealed that three schools visited him at Erasmus in a single afternoon. “I was talking to Rutgers, and Miami was outside, and Wisconsin came in later that day,” he said. This how both he and his mother referred to the recruiters: As anonymous missionaries from faraway campuses, showing up on their doorstep, monopolizing their telephone, making promises that they might or might not be able to keep. Morgan’s mother, Sharon Ellis, works as a medical assistant at Rikers Island; one evening, she came home after working a double shift and fell asleep on the couch of their Brownsville apartment while listening to a recruiter from Connecticut. She’s raised four kids on her own after her husband left to go back to their home country of Jamaica, and these rituals wore her thin. One night, the recruiters from Syracuse and Connecticut both showed up on their doorstep; one waited outside while the other went in. Morgan told his coach he wanted to take visits to faraway places, and open up his recruiting, and go through the process. He wanted to be a kid, he said, and I asked Landberg whether it was even possible to be a kid after having gone through something like this. In the final days, schools like Penn State made a last-ditch push for Morgan’s services, and Landberg put together a checklist of 14 different questions that he should be asking himself about each school. I asked Landberg if he would change anything about the process, and he said no. I asked Ellis the same question, and she said no, too. She was flattered by it, she said, because in the end, this was what her son wanted. At one point in the midst of his announcement, Morgan gazed out at his teammates and told them he hoped to see every one of them sitting in that same chair someday. For a moment, the room fell silent, and the sunshine streamed in through the broken windows.